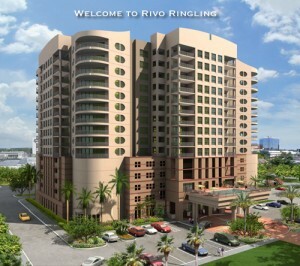 Rivo at Ringling is a high-rise condominium located at the heart of downtown Sarasota. This distinctive 15-story building features 92 two-three bedroom residenes ranging from 1,500 sq. ft. living area, as well as 14 penthouse residences on the top three floors, each providing over 3,000 sq. ft. living area. Priced Intelligently. Designed Ingeniously. Located Perfectly. Rivo at Ringling offers true urban sophistication devoid of pretense, catering to your individual needs in a private, secure sanctuary of villa-like residences. Only at Rivo do you find this uniquely designed combination of value, style and location. Rivo Ringling is literally steps from everything downtown Sarasota has to offer. Shopping, streetside restaurants and cafes, entertainment and the arts abound, not to mention local parks and marinas located only several blocks from the property. Rivo distinguishing features include designer kitchens with granite countertops and custom wood cabinetry, floor tiles in the entry and in all wet areas, luxurious master suites with garden tubs, separate showers, and bright spacious interiors overlooking private balconies offering views of Sarasota and the bay. Created to bring the outside in, Rivo at Ringling is built around a tropical garden atrium. Rivo offers a fully equipped, state-of-the-art fitness center, five levels of parking garage (three of them secured), conference facilities, and a third floor pool and sun deck. Rivo expresses a genuine urban lifestyle apart from the rest.